Your adventure begins by climbing up 20 steps to the top of this 20' slide. Once at the top the no jump safety netting will make sure all guest slide properly and safely. Take a seat, catch your breath and push off onto the incredibly long sliding lane as it propels you through a fun slide into a pool! Kids scream with delight all the way through this amazing ride. 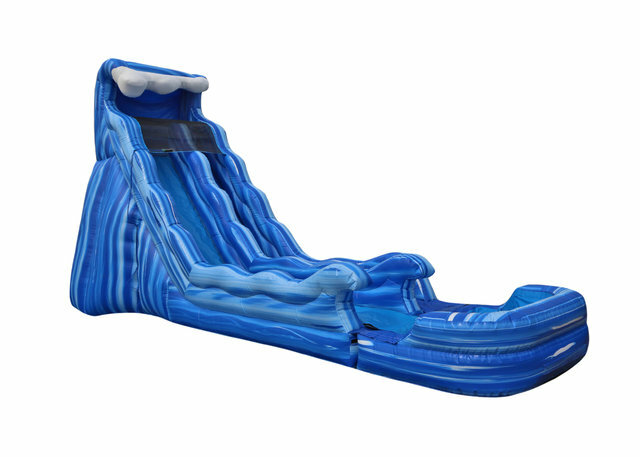 The Blue Rapids Slide features easy entrance, easy climb steps, and safety handles to the very top. Adults and kids will enjoy this adrenaline pumping slide!